This could have been a blog about cuttlefish flavoured corn puffballs if the owner of Pinoy Foods hadn't reminded me that I'd blogged about them before. I wasn't sure when he mentioned it as I didn't recognise the packet, so I bought them anyway. It was only when I got home and asked the boss (Cinabar) to check that I knew the owner was right. However the packet had changed, so I haven't gone completely daft. 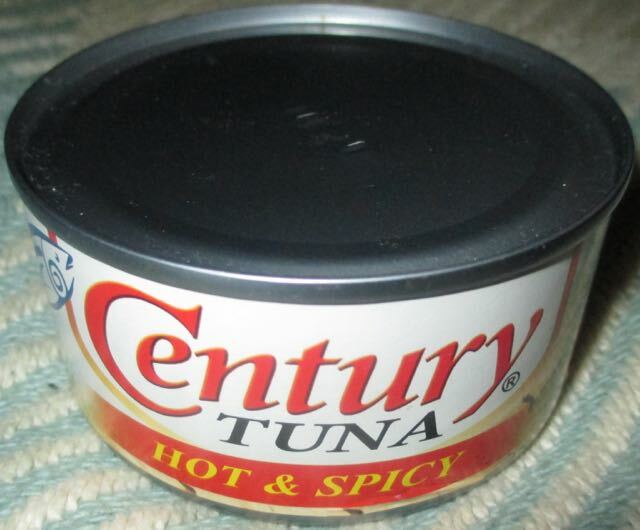 Only mostly... Having said that, I did really enjoy them when I ate them again... You're probably wondering why I'm rabbiting on about crayfish balls, well I bought this tin of Century Tuna Hot & Spicy at the same time and have just got around to making a fat sandwich out of it. I'm banned from using Cinabar's posh electric tin opener on account that I have no idea how it works and have broken two of them trying to work them out. Okay, so I am daft! On opening this tin with my children's style manual tin opener I noticed there was a lot of soya bean oil on the top of the tuna shavings. I decided to taste a little and immediately noticed a chilli burn on my tongue and that was just from the oil. I'm sorry to say that I had to drain some of the oil off though, as this would have been the messiest sandwich ever otherwise. I sampled a good chunk of tuna before dumping the rest on my sandwich. There was a good tuna flavour mixed with fiery ginger and cinnamon followed by a chilli burn. Not enough chilli and spices to kill a curious cat if you leave the tin open whilst you make some tea, but enough to make it sit up and bark! It certainly left a warming heat in my mouth and made for a very tasty, spicy and messy tuna sandwich. Next time I pick up a can of this, I'll remember it as a regular on my shelf. 180g tin. Ingredients included; tuna flakes (50%), water, soya bean oil (17%), natural ground spices (chilli 0.8%), onion powder, garlic, cinnamon, ginger, brown sugar, salt, guar gum thickener, cornstarch, whey powder, and bayleaf.